Alquist PF 2019, the Alexa Prize Finalist. We have been second in a row in the Alexa Prize out of more than 100 academic teams with our social bot Alquist. Last month the students received a 100K USD prize during the Amazon re:Invent 2018 conference in Las Vegas. We are back in CTU CIIRC, in our lab again. During the long overseas flights, we started to think what to do next. We want to present our technology in a slightly different, but more entertaining form. The end of the year, the holiday season is a great chance to engage with our friends, partners, students, all people. It was a simple decision. We have prepared an interactive PF 2019, a sneak preview of how creative we can be with the Conversational AI. Recently Amazon updated Echo Show, and Google introduced the Google Home Hub. These, screen equipped devices, are combining the Conversational AI with visual to make the user experience even more engaging. In Alquist, we believe in multimodal interfaces too. The most ubiquitous multimodal device is definitely a smartphone. The trend is clear. 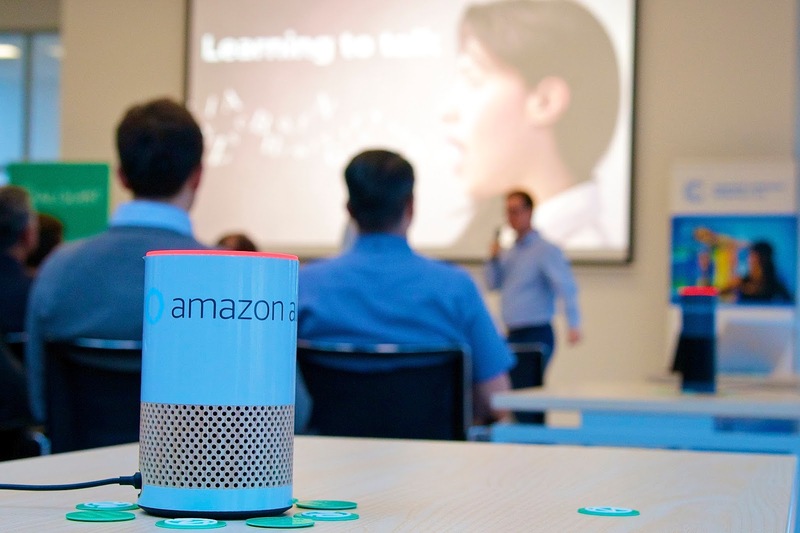 Google and Apple are continually reporting increasing numbers of voice interactions. Currently, our demo needs the Chrome browser. It is a limitation, but you can run it on a smartphone and on a desktop either on macOS or Windows. One of the big problems for the Google Home or Alexa is the discoverability. Choosing the smartphone and the browser we can post just a link, no installation is required. We are not bound to existing platforms. The user only needs to allow the browser to access the mic. We still do not support the iPhone, which is not allowing the mic access. If you own an Android smartphone, you are only one click away. Try it! We have partnered with Dazzle Pictures. They created a fantastic animation in zero time, and we designed and implemented the dialogs. At first glance, it may seem pretty simple answering ambiguously, but do not be mistaken. Give it a try, test it! For example, Alquist understands the standard English set of names only. Try how the dialog changes if it does not recognize your name correctly. 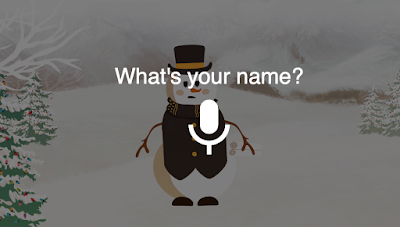 Discover how the snowman replies once you utter something not understandable. We also handle a positive and negative message etc. Have fun and let us know what you think! Check out also our first video supported demo the Alquist Story. It is high quality movie with real actors introducing Alquist. You can also ask many questions about Karel Capek. It took us a very long time to get it to a reasonable shape. We spend time shooting the movie, a lot of time in post processing and we had to overcome various technical problems too. On the other hand the animated PF 2019 was a quick shot, all was prepared, in good shape. We believe there are many opportunities for using our technology in many different business segments. We can imagine answering product questions, ask users for preferences, help set up devices, etc. We are looking for more ideas about how to commercialize our know-how. Help us to discover new opportunities! We have made it to the Alexa Prize 2018 finals again with our social bot Alquist. Our competitors are the Alana bot from the Heriot-Watt University, Edinburgh, Scotland and the Gunrock bot from the UC Davis, Davis, CA. It was almost exactly one year ago I wrote the last blog. 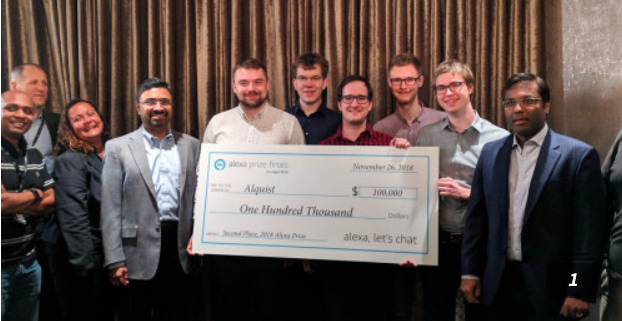 That time we were excited to get to the Alexa Prize 2017 finals, and we celebrate today again, we made it to the finals with the Alquist team again. It was a hectic time. We have completely redesigned our bot. This year when we started the semifinals, we experienced problems with data to train the new AI. As the number of interactions was growing, we were increasing the training sets and improving the accuracy. We have augmented the dialog acts classifier processing every new user utterance. It is using the convolutional neural network and classifies the utterances to around thirty classes. The significant change in the overall architecture is the dialog manager. Last year we used a rule-based approach. It was great for cooperative users, but once the user did something unexpected we had troubles. It was also a very laborious process to write the rules. We ended with hundreds and hundreds of rules. It was also challenging to update or enhance the dialogs. The latest Alquist uses hybrid dialog management. We have reduced the rule-based decision to a minimum and made the principal part controlled by an LSTM neural network. We have many LSTM models for different sub-dialogs. The sub-dialogs are trained and updated for excerpts of the bot user interactions. The hybrid approach significantly reduced the amount of work necessary to create a new dialogue compared to last year's rule-based approach. This fact allowed us to broaden the range of conversational topics substantially. We have also taken advantage of delexicalizing the utterances to improve the training speed. 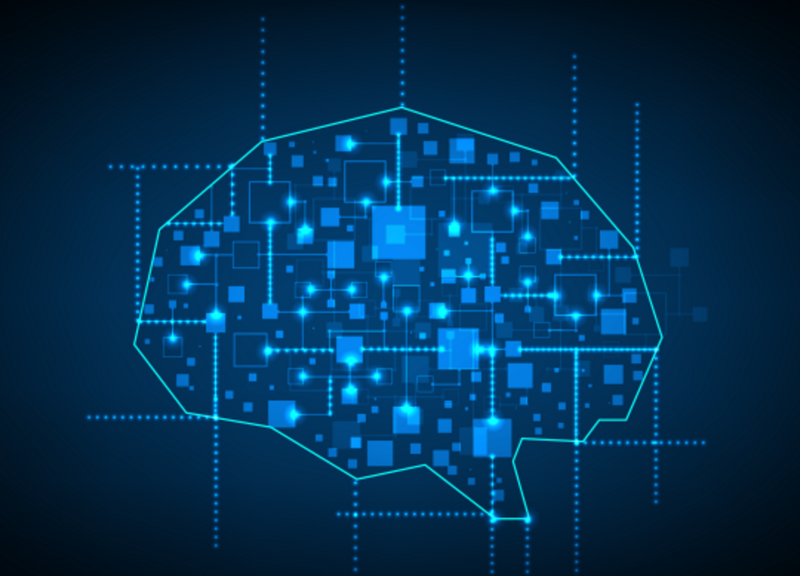 The bot includes several other neural networks helping to switch between different topics, estimating the sentiment, etc. The whole system is getting quite complicated. We have also spend a lot of efforts on improving the new information acquisition. We are crawling several social media. The discussions are an additional source of interesting facts. The social media are a great complement to knowledge databases with the factoid type of information like for example Wikipedia. The team has changed a little compared to the last year. Roman has left, and Petr Lorenc has joined. He is helping a lot with the intent, entity recognition, which is an essential part of Alquist and has a significant impact on the overall user experience. Currently, everybody is very busy since we have another at least two months to improve the functionality. We will focus on the user experience. Since English is not our native language, we have to spend a lot of effort ironing out all conversation, adding SSML, etc. Amazon will offer to the Alexa device owners only three first bots, which means we will get more data. More data gives us a chance to improve further the accuracy. Amazon will announce the winners as last year at the re:Invent Amazon Conference in Las Vegas. We are looking forward to visiting Las Vegas the heart of gambling, as well as meeting our competitors and helpful Amazon Alexa Prize staff, as well as learning the latest from the Amazon technology. We were second behind the Washington team last year. Guess what are our aspirations this year. If you are a lucky Alexa device owner, try "Alexa let's chat." Keep the fingers crossed! 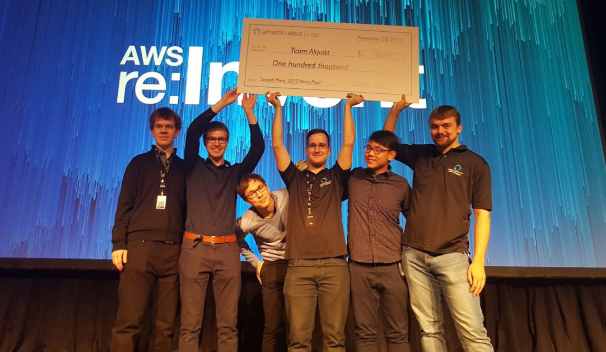 The CVUT Alquist team managed to get with other two teams to the finals of a $2.5 million Alexa Prize, university competition. Our team has developed the Alquist social bot. The whole team has met in the eClub during summer 2016. That time we have been working on a question answering system YodaQA. YodaQA is a somewhat complex system, and students learned the classic NLP. Of course, everybody wanted to use Neural Networks and design End to End systems. That time we have also been playing with simple conversational systems for home automation. Surprisingly Amazon announced the Alexa Prize and all clicked together. We have quickly put together the team and submitted a proposal. One Ph.D., three MSc, and one BSc student completed a team with strong experience in NLP. In the beginning, we have been competing with more than a hundred academic teams trying to get to the top twelve and receive the 100k USD scholarship funding. We were lucky, and once we were selected in November 2016, we began working hard. We started with many different incarnations of NNs (LSTM, GRU, attention NN, ....) but soon we have realized the bigger problem, a lack of high-quality training data. We tried to use many, movies scripts, Reddit dialogues, and many others with mixed results. The systems performed poorly. Sometimes they picked an interesting answer, but mostly the replies were very generic and boring. We have humbly returned to the classical information retrieval approach with a bunch of rules. The final design is a combination of the traditional approach and some NNs. We have finally managed to put together at least a little reasonable system keeping up with a human for at least tenths of seconds. Here started the forced labor. We have invented and implemented several paradigms for authoring the dialogues and acquiring knowledge from the Internet. As a first topic, we have chosen movies since it is also our favorite topic. Then, we have step by step added more and more other dialogues. While perfecting dialogues, we have been improving the IR algorithms. We had improved the user experience when Amazon introduced the SSML. Since then Alexa voice started to sound more natural. While developing Alquist, we have gained a lot of experience. A significant change is a fact that we have to look at Alquist more as a product than an interesting university experiment. The consequences are dramatic. We need to keep Alquist running, which means we must very well test a new version. Conversational applications testing is by itself a research problem. We have designed software to evaluate users behavior statistically. First, a task is to find dialogues problems, misunderstanding, etc. Second, we try to estimate how happy are users with particular parts of the conversation to make further improvements. Thanks to the Amazon we have reasonably significant traffic, and while we are storing all conversations, we can accumulate a large amount of data for new experiments. 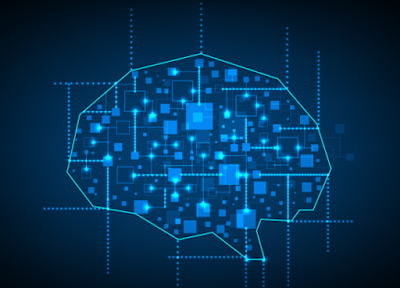 Extensive data is a necessary condition for training more advanced systems. We have many new ideas in mind for enhancing the dialogues. We will report about them in future posts. Many thanks for the scholarship go to Amazon since it was a real blessing for our team. It helped us to keep the team together with a single focus for a real task. Students worked hard for more than ten months, and it helped us to be successful. Today we are thrilled we made it to the finals with the University of Washington in Seattle and their Sounding Board and the wild card team from Heriot-Watt University in Edinburgh, Scotland, with their What’s up Bot. Celebrate with us and keep the fingers crossed. There is a half a million at stake.